Nine regular humans from different parts of the world are abducted and transformed into cyborgs with astounding powers for the purpose of being used as weapons. The nine cyborgs rebel and start to fight against their creators in the name of justice and world peace. Decades later, the nine cyborgs seem to be untouched by time, but they live in a world where "justice" has as many nuances as the number of people living on the planet. What is their place in the world now? "In the beginning was the Voice, and the word was Him; and all obeyed His word in great awe. But those who dwelt upon the land, through vanity, cunning and greed, attempted to build a multitude of towers whose tops reached unto heaven, and accumulated great wealth on earth. Scattering across the land and laying it to waste, man turned a deaf ear to His Voice. So He gave unto man an opportunity to atone for his misdeeds; and flame and smoke and the roar of a lion descended upon earth; and shattered the many towers to dust...."
Watch 009 Re:Cyborg Episodes Online at Animegg.org. 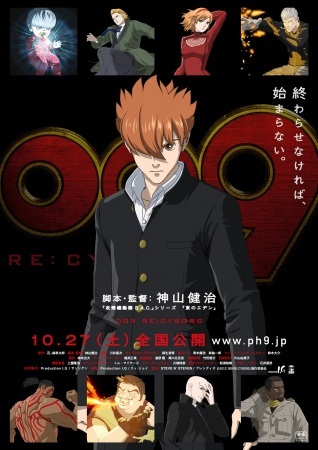 009 Re:Cyborg is available in High Definition only through Animegg.org. Choose an episode below and start watching 009 Re:Cyborg in Subbed & Dubbed HD now.